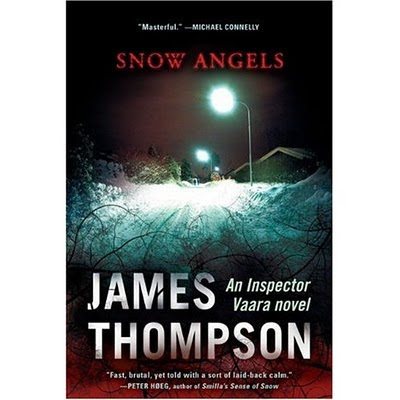 Snow Angels, by Kentucky-born but Finland-resident James Thompson, is billed as "An Inspector Vaara novel," implying that Kari Vaara, the leading character and the focus of almost all of the narrative, will be featured in a crime series. There are a number of interesting characters, a lot of interesting background for Vaara, and there's a lot of plot going on in this short novel--but almost all of it is resolved by the end of this volume. A comparison with Arnaldur Indridason is apt, because both his Erlendur and Thompson's Vaara lost a sibling and thereby incurred a lifetime of guilt and regret. But by page 264, Vaara seems to have worked through it (if that's not too much of a spoiler--at least I won't say how he accomplishes that, or who helps him). Erlendur's whole personality (and his pastime) revolve around his dead brother. Similarly, there's an ex-wife in both cases (with a lot of residual nasty feelings), but Thompson deals with Vaara's ex-wife in rather absolute terms here, while Erlendur has only reached a face-to-face confrontation (engineered by their children) by the 6th translated novel (the 8th overall, I think). And one of the most interesting characters in Snow Angels, someone whom we might expect to explore further, disappears in a plot twist that provides surprise but denies further development of the character. There are virtues in literary delay, in the withholding of information and even action, especially in an extended series. All of the above is merely an observation, not a criticism of Thompson's book--which evokes northern Finland (above the Arctic Circle) in a lively fashion (as lively as the dour Finns permit) and gives us not only Vaara but his American wife, his family, the denizens of both the town and the resort (of which his wife is manager), and a lot of insight into the Finnish character in general. The plot is very violent, in very graphic ways, and there are several despicable characters providing various theories of the crime that begins the novel (the sexual and racist murder of a Somali-born actress). There are, especially surrounding those unpleasant types, various side-plots and criminal acts to fill out the main narrative and to complicate Vaara's life. I enjoyed Snow Angels, and would probably read a sequel, but there isn't the pull of unresolved plot and character development that draws a reader from, to give a rather extreme instance, one to another of Jo Nesbø's novels. Just finished this and posting my review on Petrona today. I liked the book though felt it fell apart at the end. I wish there had been more empathy with the woman who died- a bit of her back-story perhaps. A promising debut but some aspects weren't very successful. Material Witness (who spends much time in Finland) and DJ krimiblog have recently reviewed it, too. HEY.....you think SNOW ANGELS was good? LUCIFER'S TEARS Is incredible, man, is this book great..and you can hear my interview with the author on WWW.DAVIDSBOOKTALK.COM...don't miss LUCIFER'S TEARS..and i am NOT just saying that..